NuWhirls CozyHeat heated seat and backrest is a surface heating system for Ella Acrylic Walk-In Tubs and Low Threshold shower enclosures. advanced radiant heaters provide soothing comfort directly to the surface of the or shower which allow for a heated seat and backrest. With its warm touch, delivers the ultimate in comfort, relaxation, and health benefits. 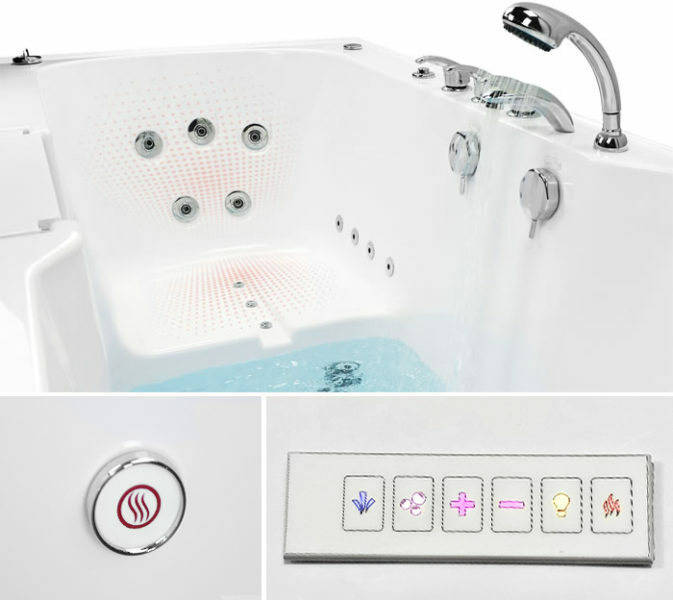 Available on all Ella walk-in tubs, NuWhirls CozyHeat systems help keep you comfortable and warm while your walk-in tub fills. CozyHeat activates in minutes, keeping users cozy and relaxed from the moment they enter the tub. These surface heaters are safe and easy to operate controlled through a simple on/off button. With one of the fastest heating curves in the industry, CozyHeat dramatically enhances your bathing experience. The heating cables are encased in a multi-layer mesh blanket, bonded together through a heat press process, providing excellent mechanical strength and a long lasting, durable design to ensure that you have an excellent bathing experience.